The Big Rib Scarf pattern is one of my new favorites for so many reasons. It’s super fast to make, it’s simple enough for beginners, it’s easily customized, completely unisex, and the end result is super chunky and warm! The Big Rib Scarf is made using 2 strands of worsted or aran weight yarn held together – or you could try it with one strand of super bulky! Either way will work, but the fun of using 2 strands of worsted is mixing and matching the colors. For this scarf I used 2 different colorways of Lion Brand Heartland. 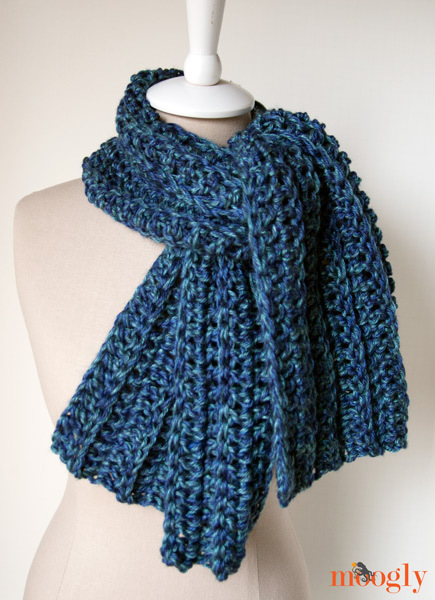 This created a tweedy jewel toned scarf and I just love the look! Beyond the colors, you can also customize how you wear it. There are instructions for a big button hole, so you can dress it up (or down) with your favorite button. Move the button hole around and get a whole new look! Or you can leave the button hole out and work it solid – then wear it as a regular scarf, or use a shawl pin to pin it in place! It’s all up to you! There are so many ways to wear it, and with all these options it’s a great unisex pattern too! NOTE: This pattern is worked holding 2 strands of yarn together, one end of each skein, worked as if they were one strand of yarn. Row 11 – 12: Repeat Row 2. Break both strands of yarn and finish off, weave in ends. 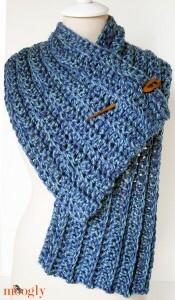 If desired, sew button to scarf as shown in photos using leftover yarn. Easy as can be, right? 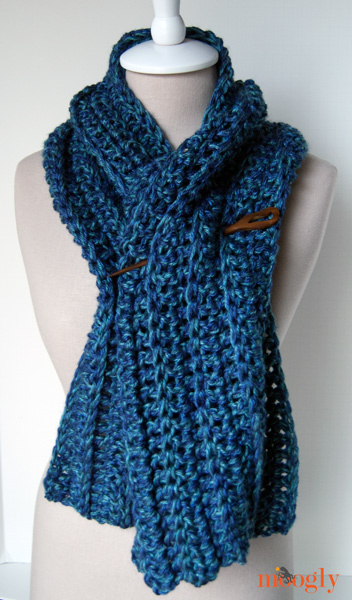 The Big Rib Scarf is so simple, but I love the look. So inviting and warm but chic at the same time. And quick enough to work up a few in time for the holidays! I hope you enjoy this pattern as much as I enjoyed writing it – and make some to share with those who need a little extra warmth! Written pattern copyright Tamara Kelly 2013. Please do not reprint or repost this pattern, but please do link to this page to share this pattern with others. If you wish to make items for sale from this pattern, please visit the About page for details. I love this scarf! It’s so Katniss! I also love the Hand Carved Crochet Hook – Size M Dyed Brown! This is so cool. I started a big rib scarf yesterday, when the legwarmers I was working on (ignoring the pattern) went slightly wrong. But I saw this on FB and decided to stick to the legwarmer pattern and work on this scarf today. Thanks for the FDC tutorial. 😀 You’re very welcome! And thank you! I think working it end to end with 3×3 or 4×4 ribbing would work! This is a great one, too, Tamara, thank you so much for all your help :-)! For this one, could you please do something about the amazon search? it goes on top of the pattern and it is almost impossible to see (just a thought, I know I can make it a pdf and see there). Hi, thanks for this great pattern! I am pretty new to crochet so I am still trying to figure out measurements and amount of yarn needed for projects. 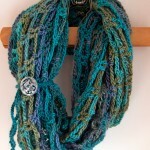 I’d like to use a bulky(6) yarn to make this scarf. Do you think 2 skeins of 120 yards will be enough if I’m not using 2 strands or should I go ahead and get 3? I think to be safe I’d recommend 3 – just hold onto the receipt! I left a message for you late yesterday but can’t find it and there was no reply so asking again 🙂 I started a scarf I have 50 dc in the double crochet foundation chain but don’t know where to go from here!! I am using Lion Brand Thick and Quick yarn which is the reason I did the foundation chain as I find it so hard to work with 🙁 I don’t know how to do the nest rows to get a good look. I’m not advanced enough to do my own pattern!!! Please please help!!! Thank you so much. Hi Linda! Sorry, I took the evening “off.” 🙂 Since you used FDC, you just continue with Row 2. The instructions for Row 2 read: Ch 2 (does not count as first st), dc in BLO of each st to end. Turn. There’s a video tutorial for BLO linked in the notes, below the hook size, yarn, etc. You’ll ch 2 at the start of every row. Does that help? I just printed this pattern which was 11 (eleven) pages of print when three pages would have been plenty. Yikes! Was it because of the photos? If you use the green Print Friendly button at the bottom of the post, you can click on the things you don’t want to print out to create a more paper-friendly copy of the pattern. Thank you for this pattern! I always use Print Friendly for patterns. 😀 You’re very welcome! Glad you like the Print Friendly option. I actually added some length to this, and am making it into a prayer shawl for my church. 🙂 120 in the foundation row with bulky weight yard and size N hook is just about perfect. LOVE LOVE LOVE this pattern, and the FDC is just fantastic! 😀 So glad you both like it Jennifer! DEAR Tammy…..you are so wonderful…thank you so much for these wonderful patterns. God Bless you for sharing your beautiful patterns. Greatly appreciated… I have some yarn…but not what I want to make this beautiful….I do have to tackle fsc. now. 😀 So glad you’re enjoying them! And FDC is so great once you get the hang of it – no more ripping out the whole row if you get the count wrong! This is my new go-to pattern for gifts. It is so fast and easy and with the two strands you can make some really pretty color combinations. Love it. Thanks, Tamara! You are the gift that keeps on giving. 😀 Thanks so much Angel!! 😀 Thank you Debbie! I got the shawl pin at JoAnn Fabrics! I’m a little confused. Does the 80 FDC make the length or the width of the scarf? thank you for sharing your pattern i can’t wait to get started. My dear you rock!! I was able to complete this pattern in an hour! The FDC tutorial was very helpful, I don’t anticipate chaining to start a project Ever again. 😀 That’s awesome! Thank you Anna – that makes my day! Do you think this pattern would be good for men? Our group wants to make some scarves for the troops in Afghanistan for this winter. Also, can I increase the length in multiples of 20 stitches? Thanks. Hi Betty! I think this is a great pattern for men! There’s no specific stitch count that it needs to be, so just chain as long as you want the scarf to be. 🙂 Thank you! I think it would make a really ice scarf for a man-I would make it longer, without the button hole and use either a variegated yarn or more “manly”colors. What does FDC mean? Front double crochet?? If this is correct I didn’t use a fdc when I made the scarf. And speaking of making for troops in afghanstan, how about using the camo yarn from Red Heart?? And if making some for the military women RH has a pale green variegated yarn that would be beautiful for the women. Must support our women troops as well as the men. Hugs and thanks to all of our military men and women. FDC is foundation double crochet – it’s defined and there’s a link to the tutorial in the bullet points with the hook size and yarn. 🙂 It’s optional – hence the alternate beginning. Great point about supporting the women as well! I followed the pattern exactly and my scarf ended up significantly shorter, even with 80 stitches. I wonder what I did wrong. Everything else looks the same though, it’s just shorter length. Beautiful pattern and works up quickly! Sounds like we just have different gauges! 🙂 Thank you! 😀 Thanks so much Barbara! Hi! I love this pattern but I’m having some confusion. Specifically with the turns. When you say “ch 2 (does not count as first st)” are those the turning chains? If so, I always used 3 turning chains when working double crochet but the pattern says two, is this your preference or part of the design? Thank you for putting up with my amatuerishness. Hi, I am fairly new as well. I have a couple questions. 1. After finishing the row, if I chain 2, in which chain do I start the next one? The 3rd one? I am confused because dc usually uses 3 turning chains (at least from what I’ve read). 2. Is there a quick way to know if I am achieving the right length? Like for example, if I measure the length of the first row, should this be 44″ long? 1. The ch 2 does not count as a stitch, so you ignore it and crochet into the other “real” stitches. Ch 3 is indeed the most common way to begin, but I think the ch 2 start gives a nicer look. I just came across your site, and I love it already. Your video tutorials are clear and understandable. I have been crocheting for a while and I do it my way anyway, but it is nice to see a video that clarifies the crochet stitches. I have had crochet patterns that call for a single or double foundation stitch, but I have never understood how to do them. After watching your video, now I know how. Thank you. 😀 Thank you so much Gina! I really appreciate you saying so! Where did you find that shawl pin? I finished my scarf months ago but haven’t been able to find a wooden pin. Thanks! I didn’t think to check local yarn shops. I found a great one! I just made this pattern for my friend as a gift, using the lion brand Oakland Black Chunky yarn, and it came out amazing. 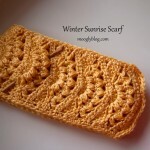 my friend Adores it, Now I can’t wait to make this pattern again and try it with two strands of the Worsted Weight. This is an amazing pattern and super easy to follow. 😀 Thank you so much Tiffany! I’m so glad to hear it! Did you use two skeins of lion heart super chunky yarn? No, I used two strands of worsted or Aran – Lion Brand Heartland (the worsted version). Love this scarf! I can’t wait to get home tonight to start! And it doesn’t look like it takes to long to whip up! Thank you for the pattern! 😀 You’re very welcome, thank you! 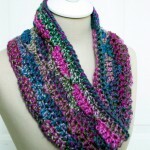 Hi Tamara, I completely love your pattern & my scarf turned out fab! I made a scarf for my son using 1 skein of Lang ‘Kim Color’ – 12 ply (100 gms, 100m). I am sending a picture of the scarf to your mail. 😀 Yay, I’m so glad to hear it Sujatha! Thank you! where did you get the beautiful “pick” (is that what it’s called?) you use to close this scarf? I am starting this scarf today, wish me luck, I am new to crochet! Thank you Deanna! I got it at my local JoAnn Fabrics. 🙂 It’s usually called a shawl pin. Just found this pattern and am anxious to try it. I’m not an experienced crocheter and would like some advise. If I use a super bulky yarn like Loops & Threads Country Loom Yarn from Michaels, would you still recommend using a US – M/N 13, 9.0 mm hook? Also, if I would like to make it a little longer, like 100 sts instead of 80 sts, do you think 3 skeins of the yarn would be enough (104 yrs each). Thanks for all the hints and great patterns! Hello Elise! If you use a super bulky, I’d use the same hook (M/N), but I would not use two strands held together, just one. 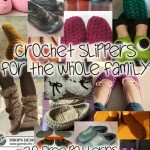 I do think 3 skeins would do it, but you might want a 4th to be safe. The color combination is absolutely beautiful, and it’s so simple, and is helping me greatly with practicing my technique. I am so glad I found your blog! Hi, I am very new to crochet. I’m teaching myself, and I’m still trying to figure things out. Since you are using two separate yarns, do you need 500 yards of each or 500 total? I realize this is probably a dumb question, but like I said, I’m new. Not a dumb question at all! 😀 500 total should do it. After completing the FDC 80, the pattern says to alternate beginning: Ch 82, then dc in 4th ch from the hook. Could you explain that a little more. I know how to chain, just not sure what you mean by ‘dc in 4th ch from hook after completing the 82. I’m sure it needs to all hook into each other somehow, just need some explanation. Thank you so much! I actually enjoyed learning the FDC and liked doing it. I should be able to continue now.? I’m glad to hear it Peggy! Thank you! Hello there – I love this pattern and am in the proccess of making my second scarf. However, I’m having awful trouble with the ends. (Turns). The first scarf I made had sloping ends and this one is going the same way. I want this one to be a gift though so I want it to be right. I think I must be making the error when I turn. I do the two chain but although I have tried placing a marker in what I think is the first stitch of the row the end is still stepped and sloping inwards. The strange thing is that one end is perfectly at 90% but the other end isn’t. Do I make the first stitch after the turn in the bottom of the chain two or the next stitch? I’m going to frog it but at this rate I won’t get it finished in time to give it and as it is for “someone who has everything” I wanted a personal gift rather than a bought one. I enjoy your blog and follow it regularly so thank you for all your hard work. I’m sorry to hear you are having trouble! Figuring these things out from a distance is always tricky. The first stitch of each row goes in the last stitch made in the previous row. 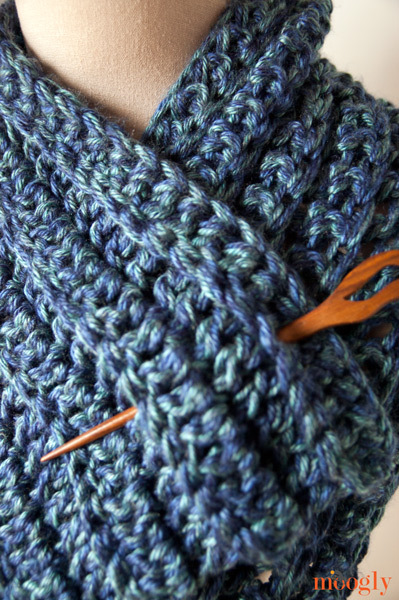 So after you make your first row, and you have the correct number of stitches, try putting a stitch marker in the first and last stitch of the row. This will help guide you as you work. Thank you Tamara. I had started using markers and it helped. I’m now starting another scarf because I like the pattern so much so I hope this one works out! 🙂 I’m glad they are helping! Just found this pattern. Have a question. How long is this scarf? I like the length shown. I love your scarf! Unfortunately I can’t figure out what you are talking about because I am not pattern save in the crochet world. I know how to double crochet of course but have never used a pattern to make a scarf! Do you have a tutorial video? I would love to see this then maybe I could make the scarf! Thank you! I’m afraid I don’t have a tutorial video for this pattern, but there are linked tutorials for the pattern stitches in the bullet pointed notes!